2" ID x .023" Wall Flex-Flyte® L-9 Hose | U.S. Plastic Corp. 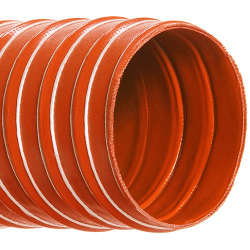 This is a two-ply silicone coated fiberglass hose with a helically wound spring steel wire imbedded between the two-plies. This hose is commonly used in the automotive, electroplating, exhaust systems, furnace cleaning, paper mill, plastics and plating industries as it is great for handling air, dust, fumes and light powder.